There’s no going back to a simple potted geranium or hanging fuchsia. Container gardening has evolved along with the rest of garden design. There are no real rules for designing in pots. If you like it, it’s a good design. Sometimes we over-think garden design and put a lot of unnecessary pressure on ourselves. Here are some easy to follow rules for creating great container gardens and still have fun doing it. Choose any container (remember – anything may be used as long as it holds potting soil and has drainage holes). Use a good potting mix, such as Ferti-loam or Miracle Gro, add Osmocote (slow-release fertilizer), and you’re ready to start. When choosing plants for your container the only limit is your imagination. Other than choosing plants with similar light and water requirements, the skies the limit Traditional plant material can be mixed with tropical plants. Don’t worry about how it’s ‘supposed to look’, go for whatever catches your eye. If you find yourself picking the same variety and color of plants every year, try something new. Your containers can be planted with pansies in the spring, followed by summer loving plants, then mums in the fall. And don’t forget that Christmas greens look wonderful through out the winter. Container gardening is easy, fun and it should reflect your personality and creativity. Baeten’s is ready to supply all of your container gardening needs such as plants, pots, soils, fertilizers, ideas, and advise. Many vegetables actually grow really well in containers. And by picking the right plants, you can create your own vegetable container garden and grow a fair amount of food in just a few pots! You can use anything from wood and plastic to clay and ceramic. Standard 6 to 10-in. containers work well for green onions, herbs or lettuce as long as they’re at least 8 in. deep. For tomatoes, peppers, or eggplants , use 5-gallon containers. These plants need more space. 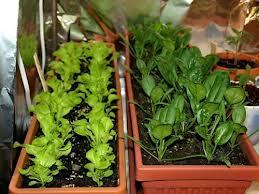 If you grow your vegetables from seed, start them indoors first, then transplant them in your containers outdoors. Get yourself 2 or 3, 12-14 inch shallow containers, always making sure they have good drainage. Plastic bowls, ½ bushel baskets, anything close will do just fine. Fill your containers with Ferti-Lome container mix, a little Osmocote for a gradual feeding, and some Soil Moist to help cut down on our watering. And now you’re ready to plant! So what do you put in your salad bowl add-ons containers? Try growing lettuce such as ‘Crimson Butter, Red Salad Bowl, Simpson Elite, Baby Romaine, or Mesclun. Any of these greens may be added to plain old Iceberg to get a variety of flavor and additional nutrients. Plant your add-ons closer than you would normally, keeping in mind you’ll be harvesting these on a regular basis. Many of your plants are “cut and come agains”, which means as your remove or harvest the young leaves, more will regrow later. So by planting several containers, you can rotate your harvesting from basket to basket. Water your plants in well, and water as needed throughout the spring season. Come June, many of these greens will begin to poop out, and at that time, your can remove the greens, and replant these planters with your favorite herbs. Then you’ll have fresh herbs to harvest, all summer long. As most of these greens do best during cooler temperatures, ‘salad bowl add-ons’ can also be planted in August for late summer and fall harvests.